The corporate world can be tough. With conflicting demands, excessive workloads, and distracting coworkers, it’s no wonder many employees are stressed out. In fact, a recent poll shows 46 percent of office workers think their job is bad for stress levels. For those working more than forty hours a week, it can be even worse. One strategy for combatting stress is to schedule short breaks throughout the day to recharge and refuel. Mounting empirical evidence supporting the benefits of mental downtime that suggests this method replenishes attention, improves productivity, and can even enhances creativity. Cal Newport, author of the bestselling book Deep Work, extolls the virtues of taking periodic deep breaks to prevent mental burnout. He suggests short walks, daydreaming, and reading as examples of good activities for recharging. How can businesses encourage employees to step away from their harried schedules and take these regenerative breaks? One strategy is to design spaces for introspection within the work environment. This can be accomplished leveraging two different approaches. The first approach is a “remove and recharge” strategy. The focus here is to create a quiet, meditative environment that gives workers a breather from the chaos of the workplace. Below are some examples of these spaces. 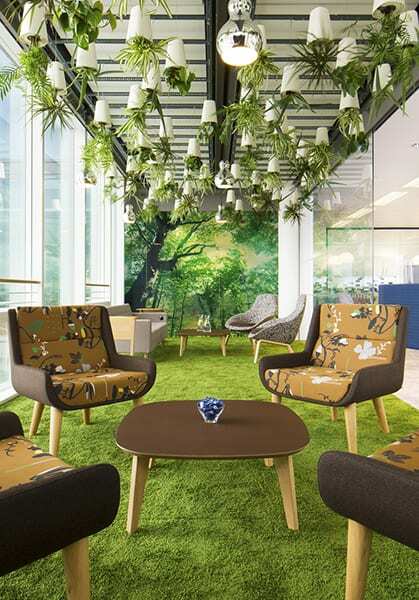 A component of the recent focus on work environment wellness, biophilia is an effective strategy to improve mental wellbeing. 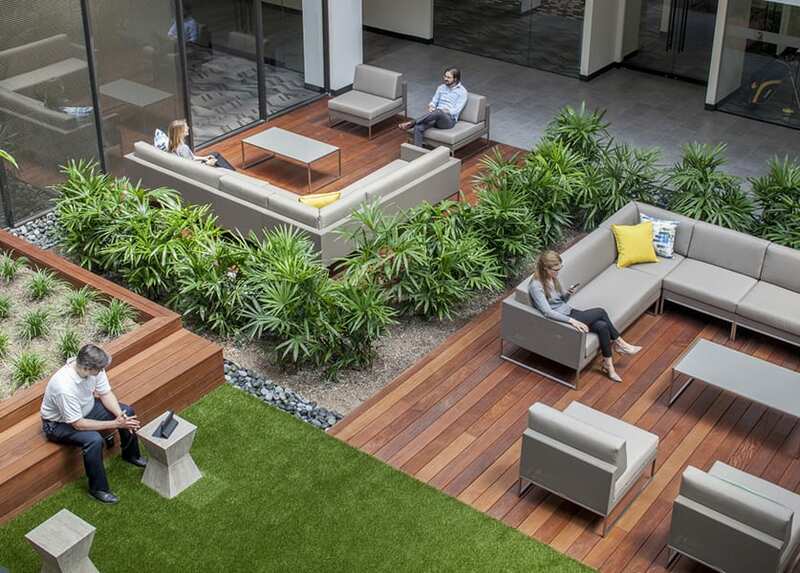 Within a work environment, this benefit can be achieved in a number of ways: provide views to the outdoors; bring plant life into the environment; and incorporate naturally-occurring patterns and materials into the design. Sapphire Systems’ office in London applies all three of these features and, in doing so, creates an immersive biophilic experience. Sapphire Systems in London. Photo by Alex Franklin Photography. At the other end of the spectrum, virtual reality applications can provide a technological approach to recharging. The New York Times VR app offers Meditation Journeys, which transport users to a variety of peaceful settings, such as a forest of redwood trees or a cliff overlooking the Pacific Ocean. What would a space for virtual reality escapism look like? 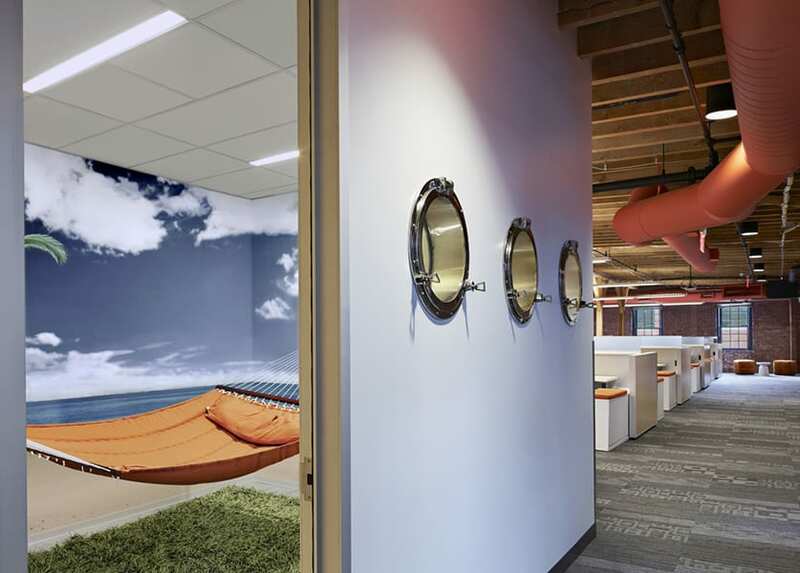 It might resemble Hubspot’s Cambridge headquarters, which includes a private room for relaxation. Resting in a gently swinging hammock, users are transported to a meditative world, far away from the stresses of the workplace. Another approach takes office workers out of the typical work environment and provides a new immersive setting with the opportunity for a mental shift. This approach takes its cues from the art world, creating unique experiences through the use of light, sound, touch, or even space. The work of artist James Turrell provides a great example. His Projection Pieces installation throws a single beam of light to create glowing geometric shapes that appear to be floating in space. These installations have a haunting quality that promotes introspection. This same concept can be applied to a work setting. 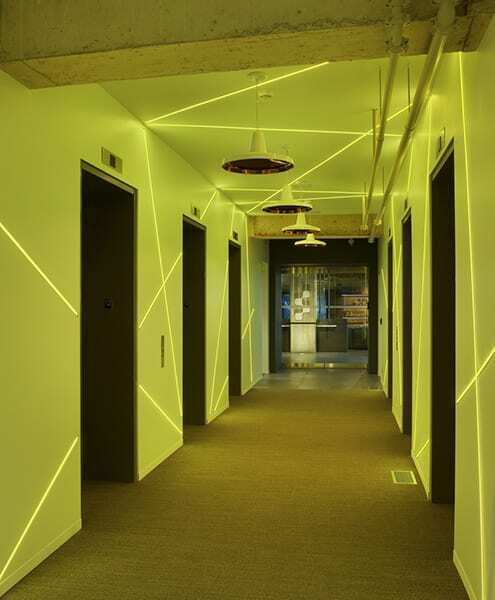 In SapientNitro’s Toronto office, color-changing LED lights surround the elevator lobby, bouncing off corners and changing directions. 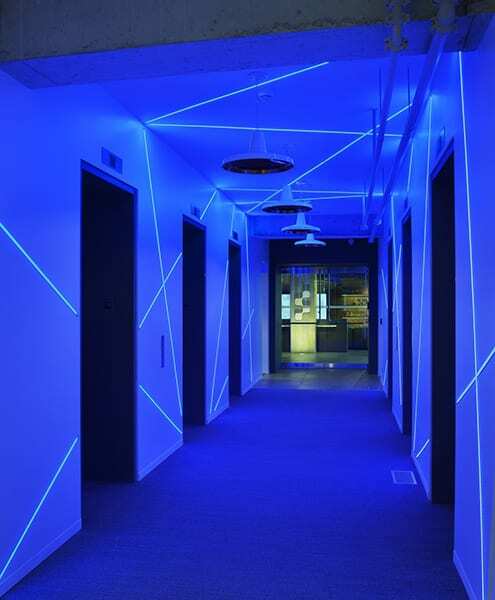 This immersive installation signals to employees and visitors that they are embarking on a new experience. The second approach for introspective spaces aims to engage workers in an activity that promotes mindfulness. Generally, these are considered activities that keep the body occupied, while allowing the mind to wander. Physical activity can be used as a tool for introspection through something as simple as leaving one’s desk and taking a short walk. The challenge is providing the right cues to encourage this behavior. A number of work environments encourage movement by providing access to walking paths. These can be located outside, with access to fresh air, or indoor tracks for colder climates. Building on this concept, the American Psychological Association (APA) created a rooftop garden and labyrinth at its Washington, DC office. The labyrinth, with its meandering paths, is an ideal conduit for self-reflection through movement. This concept can also be applied to an office interior, as shown in the sketch below. The growing popularity of adult coloring books is a great example of active distraction. It frees up the mind, while keeping hands engaged in a simple activity. Employing this approach on a large scale, IA’s Chicago office created a full-size coloring wall to engage the entire office. 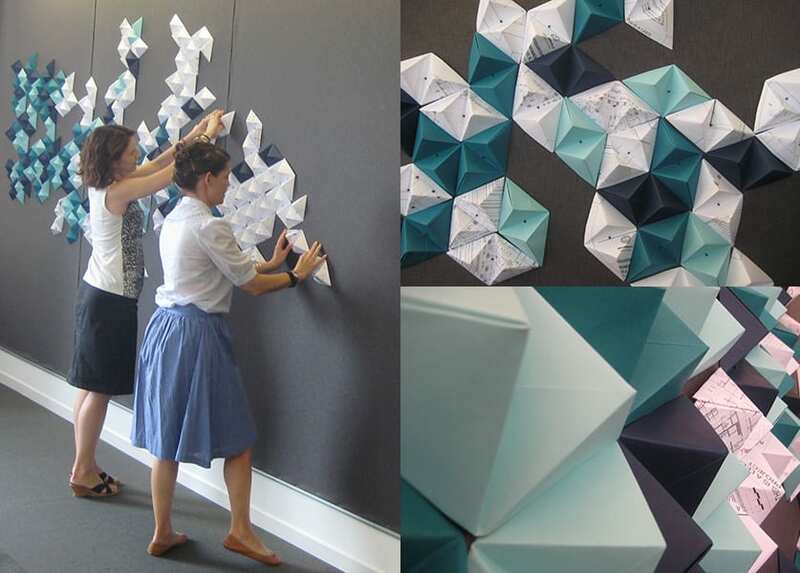 A few months later, the same space was transformed into an origami wall, allowing staff to fold and mount colored papers to create a large interactive art display. Taking time for mental breaks during the workday is a great way to fight stress and burnout. By encouraging people to pause for introspection, work environments can promote healthier, happier, and more productive employees. Then be sure to check out our blog post on Designing for the Upskilled Worker, where we discuss how building with another employee perk in mind can be impactful. Why the creation of introspective space is an absolute must in today's multi-tasking world.